LAGOS — Students of the Lagos State University, LASU, for the second day running, went on the rampage, yesterday, destroying the school’s property, burning tyres on the expressway and disrupting the second semester examinations. LASU after the protest, yesterday. The students were disenchanted with the management of the school for closing the registration portal against about 1,292 of its students who had not yet registered for the second semester examinations. The examinations, which were to begin yesterday, were disrupted by the students who vowed not to carry over their courses to the next semester due to their inability to pay the exorbitant fees charged by the school. It was gathered that the Vice Chancellor of the school, Prof. John Obafunwa, had said that only the708 students who were able to register before the portal was shut would sit for the examinations, but the students stood against this defiantly. 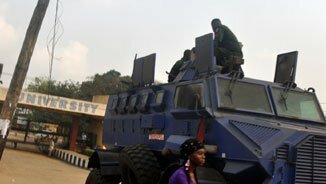 It took the intervention of soldiers and policemen to calm the situation on campus yesterday morning. The placard-carrying protesters, who had inscriptions such as ‘Obafunwa, open the registration or there will be no exams”, “Our late registration is no fault of ours, LASU tuition fees is expensive”, “Fashola, pity us, our parents are poor,” appealed to the governing council and management to have pity and allow them to register their courses, so that they could partake in the second semester examinations scheduled for between January 23 and February 5. It would be recalled that the portal for registration opened sometime in May 2013, when the second semester resumed and two weeks was given for students to register. However, the two weeks deadline was extended to sometime in July, when the five-month strike embarked upon by Academic Staff Union of Universities, ASUU, began. Since then, students who failed to pay before the closure, but later paid could not register their courses. What this means is automatic carry-over in all the unregistered courses, which is an extra year for such students. Last Friday, Mr. Femi Augusto, the university’s Pro-Chancellor and Chairman of Council alongside members of the management had a town hall meeting with the students in a bid to interact with them, share their burdens and keep them abreast of the successes recorded by the university in recent times. As the meeting proceeded, agitations for the portal to be re-opened for registration rented the university’s main auditorium. Dousing the tension, Augusto and Obafunwa told the students to calm down that something urgent would be done to address their grievances. But with the examinations that commenced yesterday, the students’ hope seem to have been dashed by an official bulletin dated Thursday, January 23, marked LASU/CIPPR/1435), which reiterated that there was no room for opening of registration portal. Speaking to Vanguard on the development, Prof. Obafunwa affirmed that there was little or nothing the management could do to allow the affected students register, as the council had decided in a meeting, Wednesday, that the registration portal should remain shut. e said: “In a joint meeting, Wednesday, between the Governing Council and the university management team, it was deliberated extensively on whether the registration portal should be opened for the affected students to register for their 2012/2013 second semester courses or otherwise. “After the deliberations, it was decided that the portal should remain shut for smooth commencement and effective administration of the scheduled 2012/2013 rain semester examination. “There is little or nothing the management can do at this moment to open the portal, because it is the decision of council and not Obafunwa’s decision. “Of the over 12,000 students in the university, about 1,292 could not meet the registration deadline. Examination dockets have been printed so there is no way the portal could be opened again for registration. Speaking further, the don said the management had been lenient enough to extend the two weeks’ grace given for registration from May to July, noting that if the students’ appeal is considered that means there is no management in LASU. “This portal cannot be opened at this moment. The examinations starts tomorrow (yesterday). There is no where in the world where it is done. If we allow the portal open, where examination dockets are already printed, students will go and do addition and deduction of courses which will definitely distort the information on their dockets. This will amount to huge complications for the university to handle.